This is the view down my driveway today. I realize that my friends in the Midwest are either laughing or shaking their heads (or both) at the relatively miniscule amount of snow – but I live in one of the suburbs of Seattle, where the only people whom you can trust to know how to drive in the snow are the ones with ski racks on their cars, and where a lot of people don’t realize that having a 4WD SUV may help you go better, but it doesn’t always make you stop (or steer around that right-angle corner at the bottom of the hill) better. And speaking of hills, we have a lot of them. And our local government agencies – particularly out in the ‘burbs and the unincorporated areas of the counties – are notoriously ill-prepared for significant snowfall, because how do you cost-justify a big investment in the necessary equipment when you only need it once every couple of years? 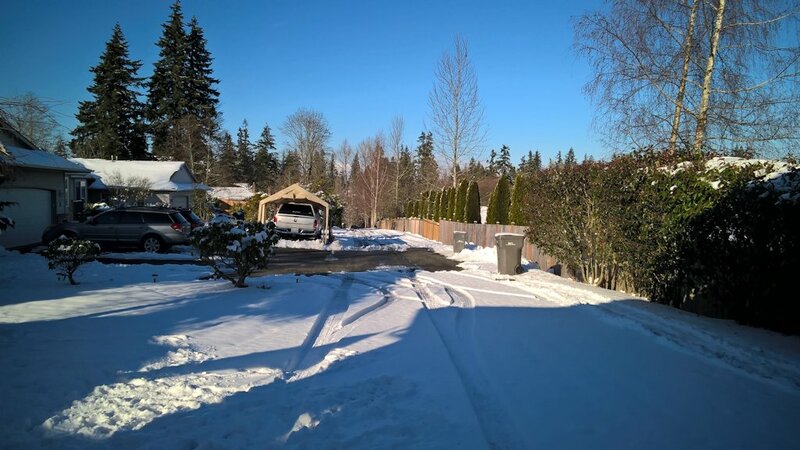 If you look closely at the picture (hint: you can click on it to get a larger version), you will see that it looks like the driveway is sloping downward in the distance. That’s because it is. And since the temperature will be dropping down into the 20s overnight for the next few days, the snow that will melt off of the neighbor’s yard down there during the day will run across the driveway, and freeze into a sheet of ice overnight riiiight where the driveway joins the road, which itself slopes from left to right, and is likely to be frozen solid as well. And that right-angle corner at the bottom of the hill? Yep, we’ve got one, but if you don’t make the corner, at least the neighbors’ cars that are parked down there will keep you from running up onto the sidewalk. So we are the Seattle equivalent of snowed in for the next few days – but it doesn’t matter to me, because I have a Citrix mobile workspace. I work from my home office even on those balmy Seattle summer days, and connect to my virtual desktop in our Tualatin, OR, data center when I need to access my critical data and applications. Speaking of Tualatin, the Portland area has been getting a bit of the slippery white stuff on the ground as well, and at least one of our Inside Sales team is also working from home today, using the same kind of Citrix mobile workspace that I use. Your employees may never have to deal with being snowed in. But there are a lot of other things that could prevent them from getting to your office, and I’m not just talking about natural disasters. There could be a fire in the building next door to yours, or a police action that blocks access to your building. And you probably have an increasingly mobile workforce that simply expects to be able to work from anywhere. The bottom line is that your employees need to be able to securely get to the data and applications they need to do their jobs from wherever they are, using whatever client device they happen to have, and over whatever Internet connection is available. And Citrix has been providing that kind of secure mobile workspace longer than anyone else, and does it better than anyone else. So don’t wait until the next “snowpocalypse” – give us a call and let us show you how to provide a secure mobile workspace for your business.